Shaun was born in San Diego, California. He's been a musician for several years and writing for twice as long. He has also finished creating a chapter by chapter musical score with his first novel "The Death of Eve" which can be heard on his FB page. Carol is not your average woman. In fact, she’s not a true woman at all, she’s a clone. But that’s only one of her problems at this point. The other problem is that people seem to be after her for no reason she can think of. It’s going to take everything she has and everything Vanguard and the Sashurai have as well to ensure she survives the trouble she’s found herself in. After all, the Uwemass, Mionne and Kernn all have their own agenda, and Carol’s happiness doesn’t play into any of them. 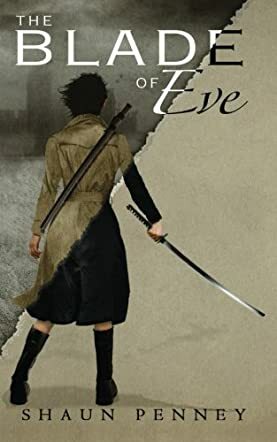 Somehow she’ll have to survive, but she isn’t the only one struggling for her life in The Blade of Eve by Shaun Penney. The characters in this story seemed very lifelike. Carol was quite a survivor and had not only a sweet side but a very strong-willed side as well. She was stronger than you would think just starting out. I also couldn’t help being drawn in by Gen and her story as well. There’s a lot going on in this world and the women especially are going to be taking the brunt of things. It’s hard to say whether they’ll all make it out alive or not or whether it’s even going to be worth getting out of alive. The Blade of Eve is a story of the future, of survival against the odds, and definitely of bravery. It was a book I enjoyed and I’ll be looking out for the next book from this author as soon as possible. I think this book only got 4 stars because it was rated as a stand alone, which it is not. It is in a series and reading it in line with the series is what makes all the books equally amazing!